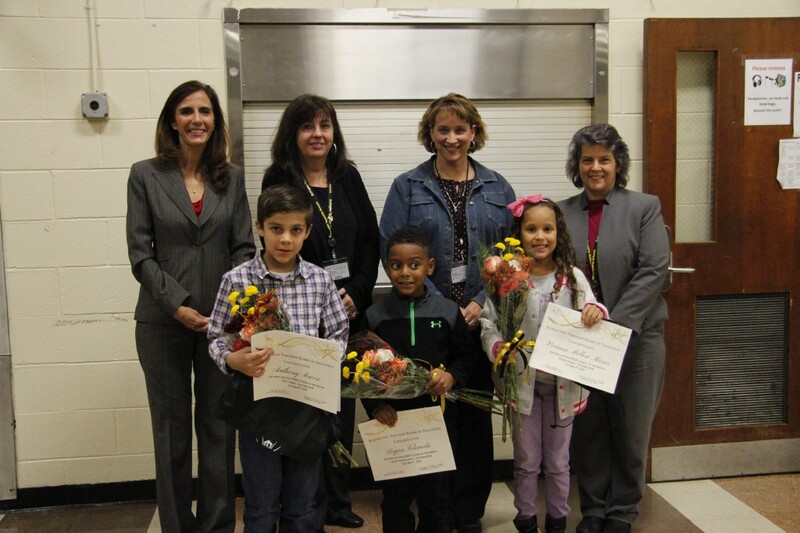 The Burlington Township Board of Education meeting began with an award ceremony honoring the Pride Students of the Month. From left, first-grader Anthony Maccri, kindergartener Logan Telewoda and second-grader Viviana Mellon Mieses pose for a photo op with (from left) Susan Eichmann, Maryann McMahon-Nester, Marliese Filbert and Mary Ann Bell. A final decision on a controversial proposal that has seen much discussion over the past two months was decided at the Burlington Township Board of Education meeting on Oct. 17. After a short ceremony for Pride Students of the Month, who were each presented with a certificate and a bouquet of flowers, the proposal came to a vote. The board voted to eliminate the honor and high honor roll programs at the lower elementary level, grades three through five. In August, principal of Fountain Woods Elementary John Johnson approached the curriculum committee with the proposed change to the honor roll program to address rising levels of anxiety in children. The proposal set off a number of discussions over the last two months, with both the school board and parents of Fountain Woods students all voicing their questions and opinions on the matter. At the last work session meeting on Oct. 10, where the board heard from a number of parents mostly opposed to the change, the proposal was tabled until the Oct. 17 Burlington Township Board of Education meeting, where final votes were cast. Board Vice-President Susan Eichmann spoke at length on the history of the proposal, the process behind the board’s consideration and her final decision to vote “yes” on the matter. She acknowledged both sides of the argument and expressed her conflicted feelings leading up to the vote. “I asked myself the question, ‘How can I base my decision on the validation of one child’s experience over the other?’ And the answer is, I can’t. I can’t base my decision on that,” said Eichmann. Although she considered herself an expert on her own children’s education, all of whom attended Fountain Woods, she didn’t consider herself a professional on all elementary school children. The change in policy came to a vote and received a “yes” from each member of the board, save for one “no” cast by board member Christopher Holmes. Holmes believed the issue was an emotional one, and felt there wasn’t sufficient data presented to support the argument that honor roll has a negative impact. Eichmann concluded with her hopes that Fountain Woods continues to acknowledge student achievement outside of the honor roll program. “We heard several times that student motivation may be impacted by this change, and I would encourage Mr. Johnson and Mr. Strauss to find ways to continue to motivate children to learn, to try their best and look forward to coming to school,” said Eichmann.